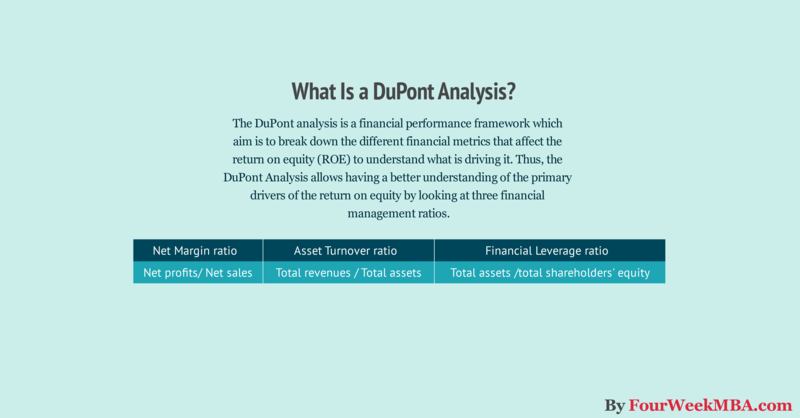 The DuPont analysis is a financial performance framework which aim is to break down the different financial metrics that affect the return on equity (ROE) to understand what is driving it. Thus, the DuPont Analysis allows having a better understanding of the primary drivers of the return on equity. The financial world can be pretty confusing at times. Financial news are spread anywhere; Gurus at each corner of the road are ready to tell you how to invest your money; Although they trust their advice so much that they don’t even invest on what they say you should invest. Financial magazines offer you subscriptions for few bucks a year, and you end up buying them all. The consequence is an excess of information, that although it was supposed to make you feel like an expert it actually killed any ability to decide how to invest. What is the purpose of the DuPont analysis? The problem of many amateur investors is that they rely too much on external information and overwhelm themselves with useless business knowledge. They start reading newspapers, watch business channels, and to learn the technical jargon that makes them feel part of the game. Therefore, rather than concerning yourself with knowing everything is going on in the financial world, or wasting your day collecting other people’s opinions, it is time to form your own! Here the second principle: “the best analysis is the one you do on your own.” In fact, if it made sense 10-15 years ago to buy financial information, it doesn’t make sense today (save few rare exceptions).You can find reports and useful data anywhere on the web. This allows you to go straight to the source. Therefore, the objective here is to form your own unbiased opinion. Third principle: “simplicity is the maximum sophistication.” Financial charts, formulas and technical jargon serve to impress people from outside the business world. Finance is not rocket science and people from the industry know that. For such reason, at times these tools are used more as a way to delude rather than for their real usefulness. Keep in mind that most of financial analysis (except very few formulas) is simple arithmetic and common sense, which I am sure everyone possesses. Having said that, where do we start to perform our own analysis? The term “financial analysis” may confuse you as well. If you are new to it and if you are not. You may have approached the discipline in the past and heard many new technical terms, such as LBO, IRR, DCF, CAPM, WACC and you rightly gave all up. But are those tools necessary to understand the fundamentals of a company? The answer is a plain “NOT AT ALL!” Although finance professionals use these tools, most of the time they are used more for justifying their pay, rather than for their practicality. I am not saying those tools are not useful at all, but to the person approaching the financial discipline, may be too overwhelming. Therefore, in this article I want to burst the myth that you have to be finance professional to be able to perform an effective analysis. But where do we start? In this article I will show you how to analyze a company by using the DuPont equation, which is a very simple but effective tool. Keep in mind that the DuPont Analysis doesn’t tell us anything about the future, but a lot on the current state of affairs. On the other hand, other complex financial tools, seem to tell us what will happen in the future, but they are based on assumptions, which if turn out to be wrong, can be very misleading. Therefore, we are better off using the DuPont analysis, which is a relative simpler tool, but more useful, rather than a complex tool that gives the impression of understanding, but can lead us to greater mistakes. The DuPont analysis uses financial ratios, which are relationships between metrics that we can find on the financial statements. Let’s start by collecting the financial data we need for the DuPont Analysis. First things first, we have to find the financial data for our analysis. Where do we get it? Bloomberg? Forbes? Financial times? None of them! We just get it from the company’s website. The 10K and 10Q are very similar forms, in which all the financial information (and also the business, strategic and corporate governance information) is reported. The main difference is that the 10K is an annual report, while the 10Q is a quarterly report. The 8K is a report the company submits each time there are relevant changes to communicate to the investors. One of the most used ratios in finance is the ROE (return on equity). This ratio is the relationship between the net income, which is the bottom line of the income statement and the shareholders’ equity (capital endowed by shareholders). This ratio explains what is the level of return generated for each dollar invested. For example, a 20% ROE means that for each dollar invested into the business 20 cents are earnings. Keep in mind that returns are not dividends. In other words, the profits generated by the firm will be not automatically distributed to shareholders. Indeed, the part of profits distributed to shareholders is called dividends. Often a company that produces high returns also distributes higher dividends compared to non-profitable companies (true in most cases). In short, a company that is able to produce a high ROE usually is also well perceived by investors. In fact, an increase in net income is usually due to improved profitability or better efficiency in the business operations. Instead, a decrease in shareholders’ equity it is usually associated to a higher leverage, which can be bad for the company in the long run. Therefore the objective here is to see how the ROE evolved overtime. Did it increase from 2014? If so, why? Net Margin, given by Net Profits over Sales. This ratio explains how profitable a company is. In short, when firms are able to have excess money left, after paying for their expenses, interests and taxes, this is called net profits. A high net margin is a good sign and usually this happens for two main reasons. On one hand, when the firm is able to charge a higher price for its products and services, or sell a high quantity of them, the profitability improves. On the other hand, when a firm is able to reduce its overall expenses, its profitability improves. For instance, the company may be able to get a better price for the raw materials, due to its good relationship with suppliers. Therefore, through the net margin we will check the level of profitability of the firm. Asset Turnover, given by sales over total assets. This ratio explains the ability of the firm to use its assets to generate revenues. In other words, when a company buys an asset, it does that to improve its revenues in the future. Therefore, from a firm, which is efficiently managed, we expect that with the increase in value of its assets, also the revenues will grow. For instance, Apple opens new retail stores (increased assets) because it wants to expand its revenue growth. Furthermore, we can expect that opening new retail stores, will positively impact the revenues of the firm. If this condition is met the company’s assets are well managed. This ratio will be expressed as number and will tell us how much revenues are generated for each dollar invested in assets. For instance, an asset turnover of 0.50, means that for each dollar invested in asset are produced 50 cents in revenues. Financial Leverage, which is given by total assets over equity. This ratio will be expressed in percentage and it will explain the amount of equity for the assets owned by the organization. The higher the number, the more debt has been pumped into the company, and the riskier the company may become overtime. Usually leverage itself is not a bad thing. Actually, in many circumstances using debt is way cheaper than using your own capital. For instance, if you try to buy a house, which costs $100K, you can put 100% capital or use 50% capital and borrow 50% from the bank. Assuming you will sell the house in one year at $120K your ROI (return on investment) will considerably increase by using leverage. For instance, if you sell the house for $120K after putting $100K of capital, your ROI before interest and taxes will be 20%, given by the profit of the sale (120K – 100K) over the initial capital invested (100K). In the second scenario, you still sell the house for $120K, but in this case your ROI before interest and taxes will be 40%. In short, you used leverage (debt) to double your ROI, and this didn’t bring any downside. If financial leverage is not necessarily a bad thing, it starts to be dangerous when interest payments rise steeply and swipe your profits away. To sum up, given the three ratios above, we need the following data from the financial statements of Apple Inc.: Sales, Net Income, Total Assets, and Equity. We are ready to move forward. We are going to get the sales and net income from the income statement or statement of operations. Furthermore, we are going to get the total assets and equity from the balance sheet. We need the data for 2015 and 2014, to understand the trend. We have the financial data, we can move forward. We are going to perform this DuPont analysis in three easy steps. In step number one we are going to compute the ROE for 2014 and 2015. In step number two we are going to run the three ratios for our DuPont Analysis. In the third step we are going to draw some conclusions. To compute our ROE we are going to take the net income and then divide it by the total equity. Usually it is even more appropriate to take the average equity for the current year and the previous year. This is because equity can change considerably between one year and the other. In this specific case tough, to keep it simple we are going to use the equity for the current year. The thing that you notice immediately is that the ROE increased by almost 10% from 2014 to 2015, it means a 26% in one year! Pretty astonishing! We want to know why this happened. We are going to find out in the second step. The net margin for 2015 is 22.8%, it means that Apple Inc. has still 22.8% of money left after paying all its suppliers, business expenses, interests (although Apple didn’t pay any in 2015) and taxes. In addition, the profitability slightly improved from 2014 to 2015 (5.7% increase). Remember that this ratio is expressed as number, that we will interpret as a $ amount. In this case, Apple Inc. in 2015 produced 80 cents of revenues for each dollar of asset invested. The asset turnover grew by 2% in 2015, compared to 2014. The financial leverage in 2015 is 243.4%, which means that most of the company’s assets have been financed through debt. Indeed, total liabilities (all the debt outstanding of the firm) represents 59% of the total assets. The financial leverage of the company increased by 17% in 2015. We are ready to move forward and draw some conclusions here. By performing the DuPont Analysis it came out that although the ROE increased by 26% in 2015, this happened mainly due to financial leverage. In short, Apple Inc. increased its level of debt considerably in the last year while its shareholders’ equity didn’t keep the pace. In fact, profitability and asset efficiency respectively increased by 6% and 2% in 2015. Instead, financial leverage increased by 17%! This is not necessarily a bad thing. In fact, it seems that Apple will be able to manage its interest payments in the future, given its high profitability. On the other hand, due to this increased debt burden we may expect to see less profits in the future. We may go even further and check in the 10K why Apple Inc. is using debt to increase its ROE but we will stop here for simplicity sake. In this article I wanted to show you that it is possible also for the non-finance professional to make his own analyses by using tools, which are simple and effective. What we did so far was to take some metrics from the main financial statements to understand what was going on with Apple Inc. ROE and we ended up analyzing profitability, asset use and financial leverage of the company. This is of course part of the picture, but it is a good starting point. If so far you thought that learning financial analysis was impossible for you, you may want to reconsider that. In this video, I show you how to perform a DuPont Analysis in Excel, from scratch!